The first part of this webpage could have been called "Nervous Little Birds" due to their flittering flighty nature - which makes them more difficult to photograph. 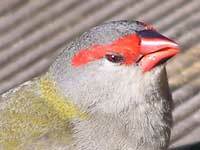 As with the Larger Birds Group, it is an arbitrary grouping to facilitate finding birds on this website. 25-30cm (10-12 inches) has been chosen as the size limit of the group. This is measured from bill tip to tail tip. 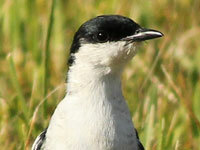 As a guide, magpies and seagulls are around 40cm - while wrens and robins are around 15cm. 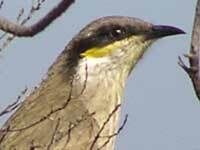 The second part of the webpage is the honeyeaters (Family Meliphagidae) which includes honeyeaters, wattlebirds, friarbirds, miners, spinebills and chats. 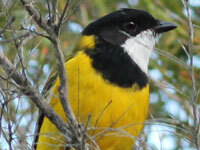 There are about 75 members of the honeyeater family in Australia - twice that many worldwide. Found in greater south-eastern Australia. 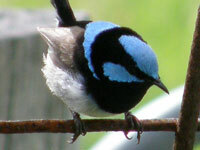 Like all Fairy-wrens, it is only the male that has the colourful plumage and only when breeding. and another from Orbost, Vic. The easiest to identify as it is all blue. Here's two images from Margaret River, WA. The first image shows a male and female; the second image shows a female. 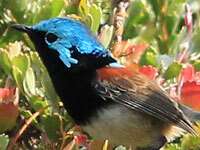 The Red-winged Fairy Wren is hard to distinguish from three very similar relatives. 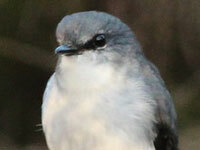 Its location and silvery-blue mantle helped greatly. Here's an image of a moulting male. Found throughout Australia - except the more arid areas and Tasmania. It is known for pursuing and catching insects in flight. Its even colours, black lores and location identifies it. It is found in the south-west of Western Australia. 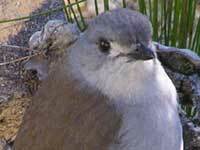 The Grey Shrike-thrush is found all over Australia, and as with many birds it has slight variations in this area. The female has a white ring around its eyes. This poor little bird crashed into our window, and was stunned for quite awhile before recovering and flying away. (It's left foot is not caught.) It is found along the eastern coast and tablelands from Cape York to Adelaide. The White-throated Treecreeper is found on the coast and adjacent ranges from mid Queensland around to Adelaide. 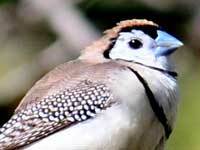 The female has an orange mark on her cheek. Their back is a solid browny-grey colour. 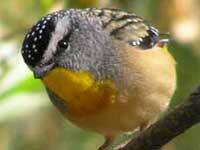 The Spotted Pardalote is found in the forests and woodland in the southern part of Australia. The female has a cream throat. Found along the eastern and southern seaboard and ranges and Tasmania. One of many busy little brown birds. 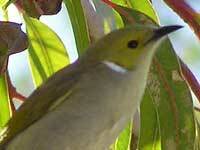 It is found along the coast and adjacent ranges in the southern half of Australia. 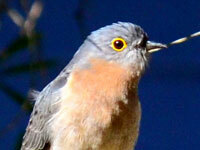 Easily identified - if you can get close to this nervous little bird. 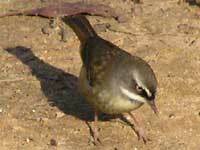 It is also found along the coast and adjacent ranges in the southern half of Australia. 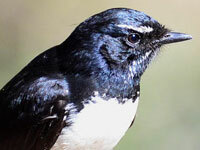 A member of the unmistakable Fantail family - which includes the Willie Wagtail. 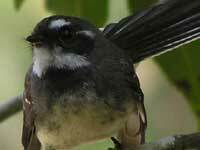 The Grey Fantail is found throughout Australia. 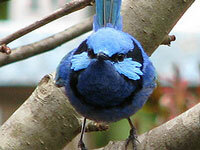 This reasonably well-behaved bird was introduced in the 1880s into Sydney. We have a pair that nest most years in our garden and help out in the veggie patch. Here's another image. 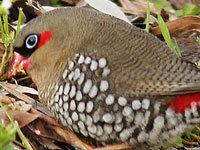 There are 5 or so firetail finches - fortunately they tend to have their own discrete area, so are relatively easy to identify. This is a breeding male. 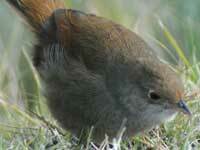 This endangered bird is shy and lives in coastal heath on Australia's south-eastern coast. Here's another image and another. 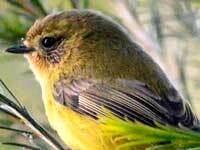 This delightful little bird, is found along the eastern seaboard and ranges. A frequent visitor to my garden it flicks its tail while sitting hunting for food in the garden. Recognised by its two black bands, this member of the finch family is found from in NSW, Qld and the northern parts of NT and WA. Found throughout Australia, except Tasmania, this easily recognised bird flits and skips over the ground wagging its long black tail. 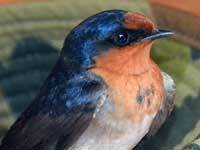 Found virtually throughout Australia, the Welcome Swallow has a characteristic long forked tail. This swallow came into Alan's van and seemed quite content to sit there while being photographed. Distinguished from other cuckoos by its full chestnut breast and yellow eye ring, it choses fairy-wrens and thornbills nests to lay its eggs. Recognised by the streaked ear coverts. It ranges in eastern Australia from Adelaide to Cairns. The Honeyeater Family - Family Meliphagidae. Found throughout Australia except on the eastern seaboard. 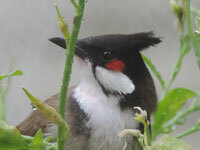 The Birds In Backyards website provides further information. Identified by the white plume on its neck, this honeyeater is found in most parts of Australia except the tropical north. 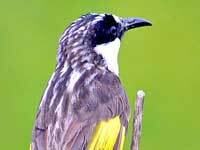 There are over 50 native birds called honeyeater. 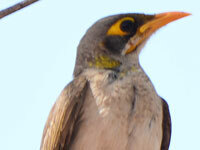 This one is distinguished from similar birds by the white around its eyes. It is found in south-eastern Australia and the south-west of WA. New Holland was an early name for Australia. 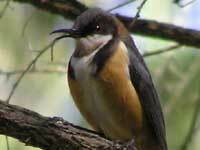 The female Eastern Spinebill has an olive-grey crown, whereas the male has a glossy black head. Found on the east coast and hinterland from northern Queensland to Adelaide. A fearless bird that "shapes up" to Magpies and Currawongs. Its distinctive cry of alarm when a threat appears, rapidly brings the whole family around. 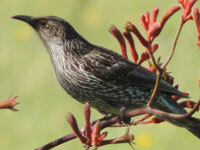 The Red Wattlebird has a distinctive pinkish red wattle near its ear. 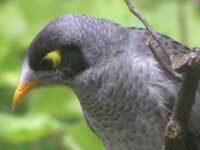 Its red eyes also differentiate it from other wattlebirds. 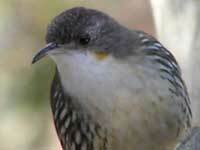 The Red Wattlebird is found in the south of all mainland southern states. Found in woodlands in the Eastern States and the Top End, it's blue face quickly identifies it. 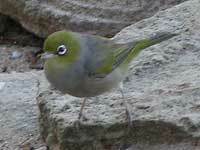 Here's an image of a juvenile (photo taken in Wooli, NSW) - note the green face. Found throughout Australia, except the eastern seaboard, Victoria and Tasmania. 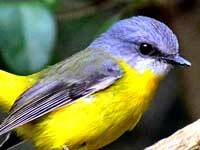 It is distinguished from other miners by the yellow skin that runs from its beak. 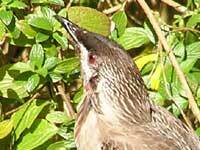 A wattlebird without the wattle. 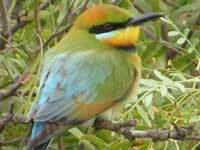 This fellow is found along the coast and nearby ranges from southern Queensland to Adelaide and parts of Tasmania. Found in open forests on the coast and ranges from Melbourne to Gympie in Queensland, this Miner is identified by the orange-red patch behind its eye. 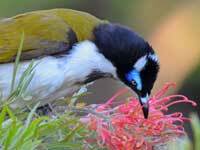 Also known as the Bellbird, it is the subject of Henry Kendall's poem - "Bell Birds". 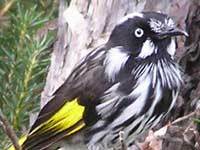 Found on the east coast and ranges in NSW and Queensland, and in the South-West of WA, its black iris distinguishes it from the white iris of the New Holland Honeyeater. Found on the east coast and ranges from Cairns to Melbourne. 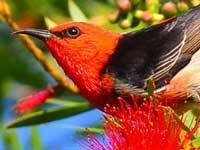 The Red-headed Honeyeater is found in the "Top-End". 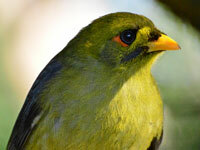 Here's an image of a female Scarlet Honeyeater from Brunswick Heads, NSW.